In last year’s post, T Side / L Side: Holiday Wrapping, we introduced you to our homes and our own personal design styles. We each have our own “side” or way of doing things, which makes us unique.When we plan our gift wrap for the holidays and ways to decorate our spaces and make them festive, these distinct styles carry through. With Chanukkah starting tonight and Christmas just around the corner, we thought it would be fun to recreate last year’s post and give you some last minute ideas of how to wrap and decorate for the holidays. It is truly an amazing experience to be celebrating Thanksgiving and Chanukkah together this year. We really wanted to take advantage of this opportunity and include aspects of both holidays into one cohesive look. Here are our different takes on this concept. T Side: This year, my overall look takes on a rustic edge with a little bit of glam. It mixes the feeling I get during the Fall season with the traditional blue and white of Chanukkah. I incorporated in pine cone details to tie my whole look together. My gifts are wrapped in festive pine cone print and navy blue craft paper. I tied them up with all different textured ribbon and twine in shades of blue and orange. My chanukkiyah is on display with these beautiful decorative tea lights and pine cone accents. This dreidel garland really adds a touch of sparkle to my fireplace. Not bad for a white elephant gift huh? I fell in love with these miniature pine cones as soon as I saw them, and knew they would be good for trading out my regular potpourri. L Side: As this is Ava’s first Chanukkah, I thought it would be fun to focus on that concept and even include her in my decor. A little bit of burlap, a lot of craft paper, and adorable photos really go a long way. Each gift showcases a photograph of the recipient with Ava in lieu of a card. Mini pumpkins left over from my Halloween display add color when mixed into the pile of gifts. Each night, I will be reading a Chanukkah story to my little girl from her fun collection from Grandma. They are out and ready to go. This burlap remained in my tray from my Halloween decor. I mixed in a Fall scented candle in lieu of the skull that sat here before. A little burlap adds a rustic touch even to this glamorous candle display. “Sometimes we are the same, sometimes we are different, but we are always twin sisters.” As you can see, we each have our own style when it comes to wrapping and decorating for the holidays. In your own holiday decor, which “side” do you relate to most? Wishing all of our readers a wonderful Thanksgiving and a very Happy Chanukkah. Happy Holidays from Side by Side Design! This month’s Craft Club meeting had a change of scenery and was a bit impromptu. One of our members had just returned from vacation and decided that she needed some time to craft with the girls. So at the last minute we gathered together in her home to work on Thanksgiving and other holiday projects and share in her travel stories. Our host, Hannah, kept her pumpkin for us to see as she was unable to attend last month’s Craft Club meeting but still found time to work on the project in her own home. As always, our time together began with potluck snacks. Although many of our members love to show off new recipes they have, Whole Foods is definitely a go to spot for last minute delicacies. We enjoyed prosciutto, pepperoni, savory cheeses and crackers, grapes, a beet and butternut squash salad, and cider to get us in the holiday spirit. To an outsider, this Craft Club counter may look like a huge mish mosh of random materials. However, we pride ourselves in saying that our members are very creative and always turn what may look like a little bit of this and a little bit of that into a masterpiece. Hannah’s newly designed place even has its own craft room. We love how organized she keeps all of her supplies and how she was more than willing to share materials with the group. We look forward to posting more details from this beautifully designed space soon. We decided to use this time to create cards and tags to give out for the holidays. In this photo you can check out the color scheme we went with as well as the patterns and textures that brought a pop of Fall to our overall look … finished product coming soon! Hannah will be celebrating Thanksgiving with her boyfriend’s family this year, and has been given the very important job of decorating to make things festive. She created these fan flowers with prints from Paper Source to set the tone. Another Craft Club member used this time wisely. She made a few cards which she wrote messages in, addressed them, and prepared them to be sent out. All in a day’s work, right Mel? Jacquie will be hosting Thanksgiving this year for her family and friends. These beautiful place cards were crafted with love and will allow each of her loved ones to know just where to relax and enjoy their meal. As always, we truly enjoyed this month’s Craft Club meeting. For a last minute planned event it went as well as ever. We look forward to making holiday treats next month with “the girls” and creating decor for our homes and / or Christmas trees. 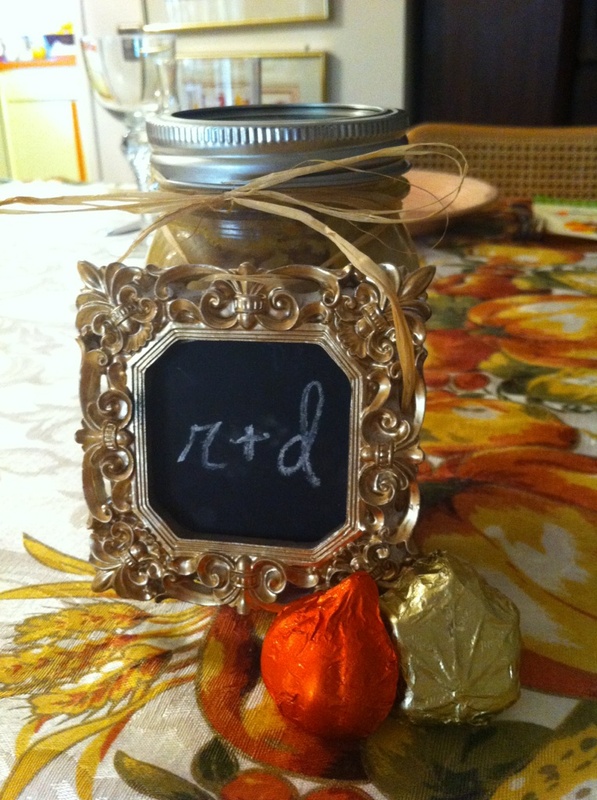 We hope we have inspired you to create your own Thanksgiving place cards and other festive decor this year. Keep on crafting! Photo Booths seem to be everywhere these days (weddings, graduation parties, and even charity events). Tami has gotten her photo taken with every style of glasses, wig, and hat under the sun, and to be honest, up until last week Tami hadn’t had one photo booth experience that stood out in her mind as special. She was starting to see them as all the same. 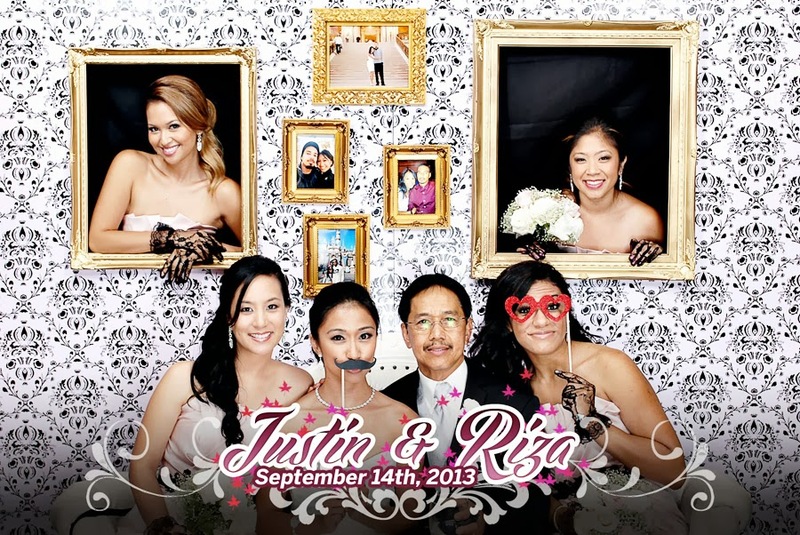 Until she attended an event last week and lo and behold (once again) a photo booth was set up in the back. This time at an ice skating rink … new venue, new company. After being forced to put on a pair of over-sized sunglasses with attached mustache by her friends, she proceeded to make funny faces with lights flashing all around her. Tami noticed something really different about this particular experience. The first thing she noticed was that Cliques Photo Booth had fun props that she had never seen before. Props that seemed to be hand selected especially for this event. That’s not all … their staff (and owner, Dov Viramontes) are extremely professional, they package their prints beautifully, and they seem to be front and center of what’s going on with the latest technology. Cliques Photo Booth has turned this skeptic into a believer. Tami knows that she will be using their services for her next event and you should too! Check out this video for more information on this awesome company. I was quite complimented when Tami asked me to write a blog about my business, Cliques Photo Booth. Tami, again, thank you! Out of 75 photography majors in my college graduating class, I was only one of a very few, like three, who decided that I was sticking with my passion and going into the photography business. Like every other guy in the world, of course, I thought I’d be photographing high fashion models, which I now sometimes do, and Ansel Adams type nature scenes to support myself. I soon found that there was another venue that could be fun and profitable. I’m a Jewish guy. I had a bar mitzvah and my parents are praying day and night that someday I’ll have a wedding. Oddly enough, they’re both what I call party phobic. But I love doing events. I dug out all my old college photographic equipment and lights, designed and custom built my own portable photo studio, designed props and backdrops, that I make myself, and put together a business. Now, after only six years of putting myself out there, at least three times a week, I’m out doing shoots at other people’s happiest events. And I have so much business, that I’ve expanded to having ten engaging employees, so we can do up to four events a day during busy seasons. 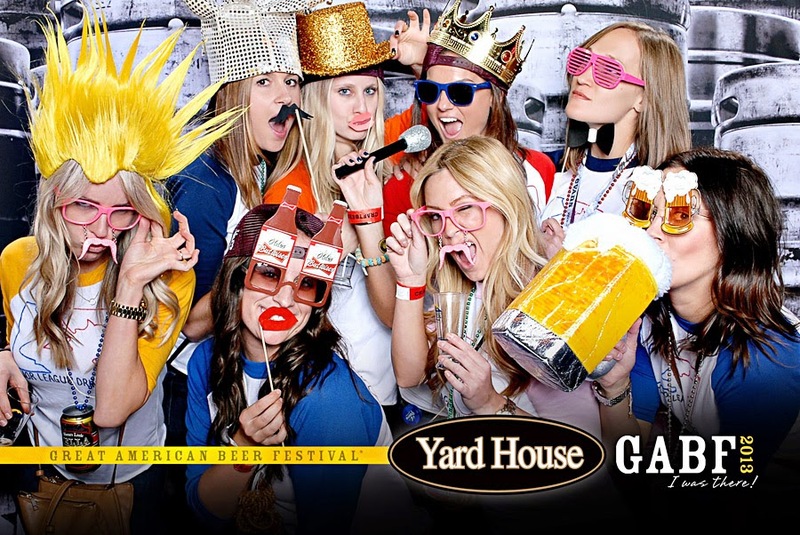 We also do corporate parties, like Hyundai, Yard House Restaurants, Verizon Wireless, and Coca-Cola, and charity events of all types, even for celebrities like Katy Perry, Tony Hawk and Molly Sims, which are fun. 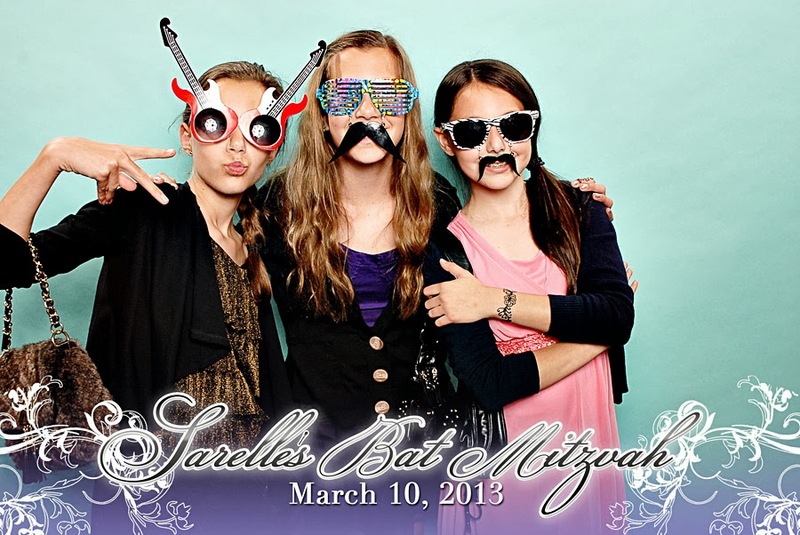 Our photo booths are always the focal points for guaranteed hilarity for the evening, as people come back, again and again to take crazy shots and go wild with images. With the same professional equipment and lighting that you’d find at a Hollywood studio, the shots come out fabulously, and we have iPad stations so hip people can immediately upload to email, Facebook, and Twitter. It’s just great to be making people feel relaxed and happy and give them something they want. Everybody has to make a living in this crazy economy, and I’m just glad that I found one where I can actually use my talents to support ten employees and myself. Not so bad for just a photo major. Next week, households across the United States will be cooking turkeys, gathering together to tell what they are thankful for, and possibly even catching a football game on TV. That’s right … it is almost Thanksgiving! It doesn’t feel like a year has passed since we were getting ready for this joyous holiday last. 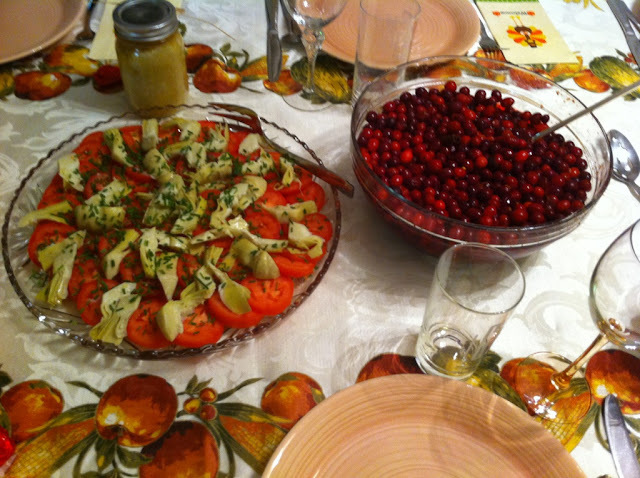 Here is a look back on what we did to decorate our Grandma’s table (last year) for Thanksgiving and the delicious yet traditional foods we look forward to every year. The table is set with a casual feel. Grandma’s beautiful tablecloth, festive napkins, and homemade framed chalkboard place cards (seen on our previous post, Craft Club: Thanksgiving Place Cards) add a nice holiday touch. This centerpiece cornucopia with pumpkins and gourds dresses up the table quite nicely. Now for the food … spiced cranberries are our favorite! In fact, a few years ago, we took over making this dish. We can’t share the recipe though … Grandma’s secret is safe with us. We also love these sliced tomatoes from Grandpa’s garden and artichoke hearts topped with chives. You can’t have Thanksgiving without the turkey, and our family has tried all of the different trends. We have done traditional oven baked, deep fried, and this year we are getting our turkey free range organic. Sometimes we even throw in a couple kosher turkey legs for our sister and brother-in-law. This traditional green bean casserole topped with fried onions is a staple of our holiday meal. And our mom’s favorite … yams covered in toasted marshmallows! Don’t forget the stuffing … not one of Tami’s favorite dishes, but seems to make everyone else’s dinner complete. You can’t have Thanksgiving without pumpkin pie, and last year we decided to create something new out of a traditional dessert. 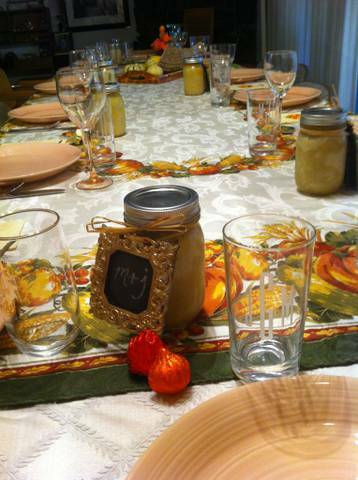 In our post, DIY: Pumpkin Pie in a Jar, you can get all the details on how to Do It Yourself. 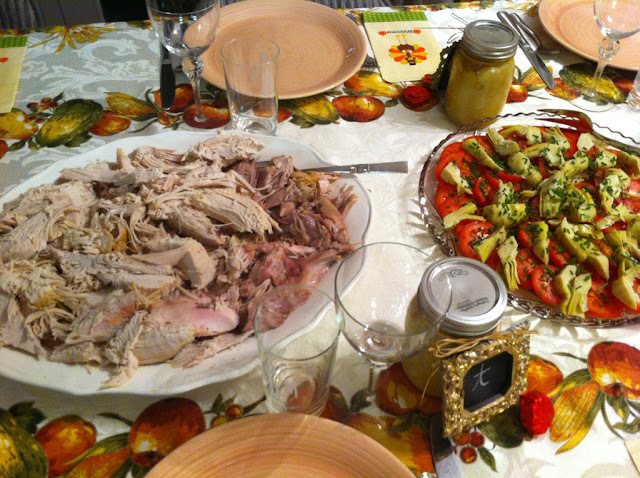 We hope you have enjoyed this little look back to last year’s Thanksgiving festivities. We truly can’t wait to do it again this year, savoring all of our favorite foods but with a Chanukkah twist. Happy beginning to the holiday season to all of you and yours from Side by Side Design! On Monday (in our post Thanksgiving Dinner Inspiration), we shared ideas for a large at home Thanksgiving or Thanksgivikkah gathering. In keeping with this theme, we have prepared a menu that is a little less formal than a normal Thanksgiving meal but has elements of both holidays involved. We have seen a few informative articles written on this very topic (where they have combined ingredients from both Thanksgiving and Chanukkah to create one spectacular meal).We know that this idea is not exactly original, but wanted to see if we could take the concept one step further, taking the Thanksgiving leftovers and incorporating them into a traditional Chanukkah meal. Start off your meal with a signature cocktail. The apple flavor of this sparkling champagne cider with a pumpkin pie spiced rim is reminiscent of one of our favorite latke toppings. For an appetizer, how about fried squash blossoms to incorporate the oil element of the holiday? … or these squash fries would be nice as well. The dipping sauce (Greek yogurt and Sriracha) sounds simply delicious and reminds us of the sour cream we use for dipping on Chanukkah. We like our latkes best when paired with our Grandma’s famous brisket. We honestly have no clue what’s in the sauce, but it is always so amazing. If you are creating this meal after Thanksgiving, you can use your leftover turkey to make these delicious sliders with a spicy cranberry spread. Marinating the turkey in your favorite barbecue sauce will give it that moist brisket flavor. traditional potato latkes we all know and love. In Israel, instead of potato latkes the traditional way to use the oil is by frying up a bunch of delicious jelly donuts for dessert. In keeping with the Thanksgiving inspiration, we found these pumpkin pie donuts to combine our favorite desserts from each holiday. The last thing we think of, when it comes to food and Chanukkah, is chocolate gelt (those tin foil covered coin looking things). For this event, how about pumpkin truffles? You get the chocolate “gelt” feel with a jelly-like surprise in the middle. We hope you enjoyed this inspiration post. All of the recipe links have been added for your convenience. This year, when you sit down to prepare your Thanksgivikkah (or one or the other) menu, keep these ideas in mind. Let us know if you make any of these dishes for your own dinner party or if you have any other ideas in mind.